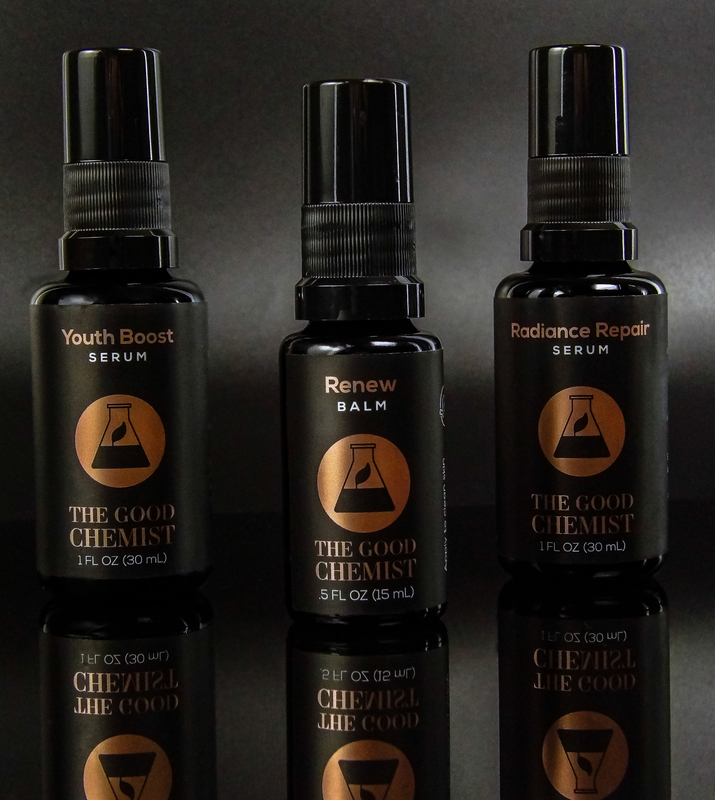 Retinol and Vitamin C serums, as well as pricey anti-aging cream and moisturizers, are an investment. 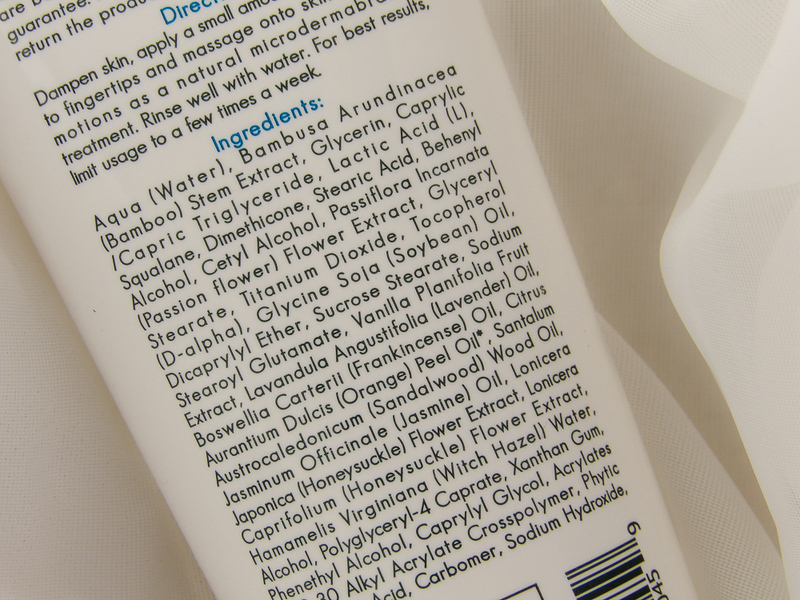 But dead skin cells are a barrier to these products living up to their true potential. Exfoliation removes bacteria-trapping dead skin cells that can result in acne, dull skin, and block topical serums and creams from absorbing well enough to perform optimally. But not just any old exfoliating wash will get the job done right. Most scrubs contain ingredients too harsh for the delicate facial skin. 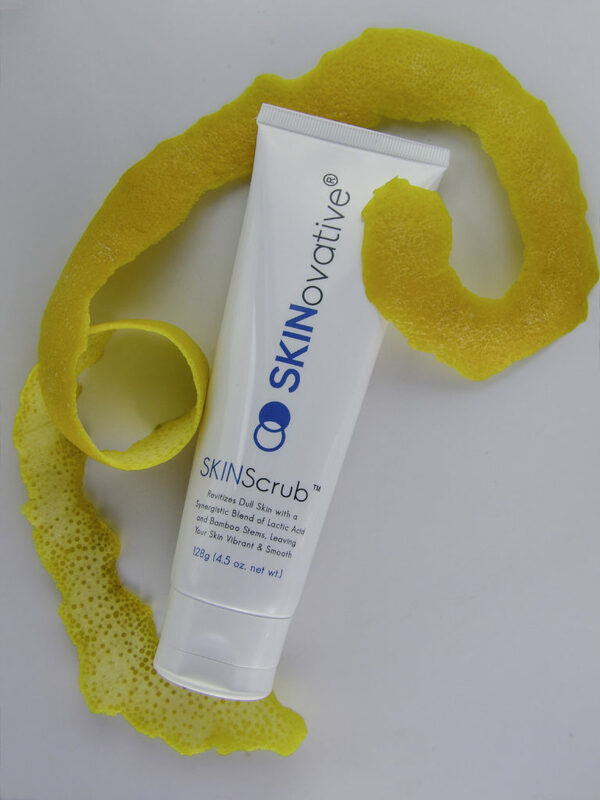 That’s why we love SKINovative Exfoliating SKINScrub Cleanser, it’s gentle and natural yet effective. Some dermatologists say many commonly used exfoliating grain agents are too large, rough and too sharp. 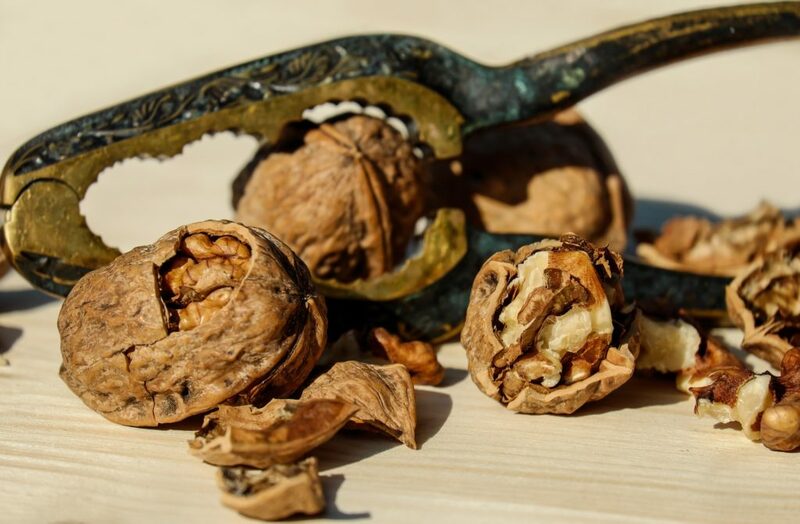 Many scrubs, including from some popular brands, use pumice or walnut shell granules that are unsuitable for the face as they can cause irritation, redness, and even tiny abrasions and fissure microtears that can inflame and even infect. Even if you manage to avoid infection, the skin is likely left too raw to tolerate treating serums and creams. 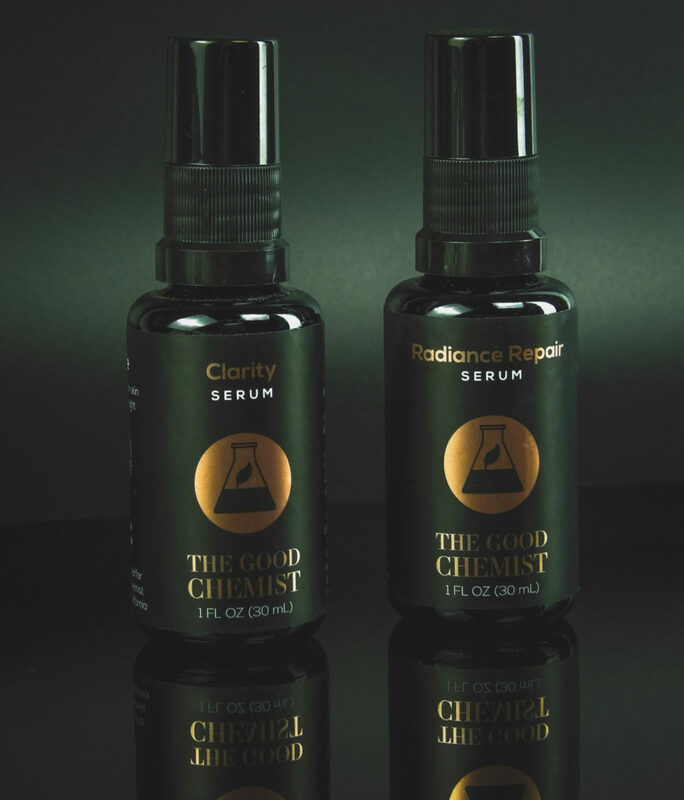 Made with antioxidant-rich Bamboo Stems and Lactic Acid, amongst several other treating and nourishing natural ingredients, it gently but effectively decimates blackheads and comedones, reduces sun damage, scars, cellulite, and wrinkles. There are no harsh abrasive agents. It can be used anywhere on the face or body to achieve youthful, glowing skin. It is gentle enough to exfoliate with and then immediately apply a treating serum or cream without experiencing irritation. 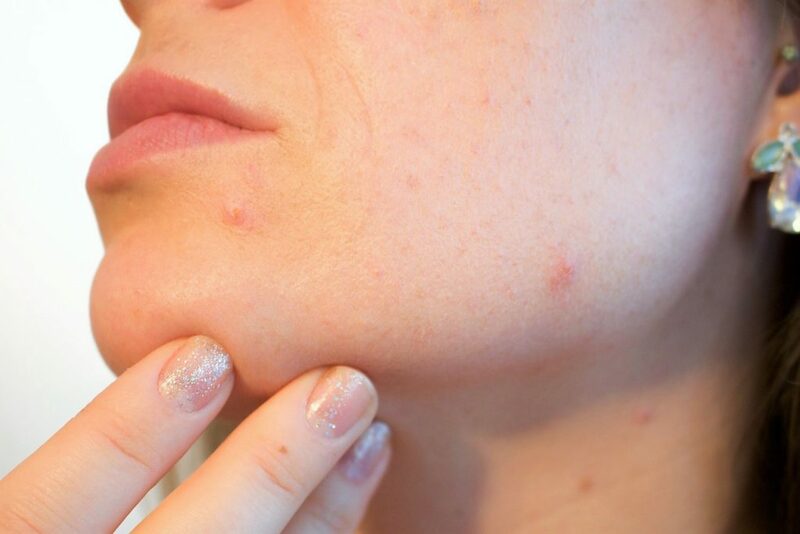 Treating adult acne is difficult. 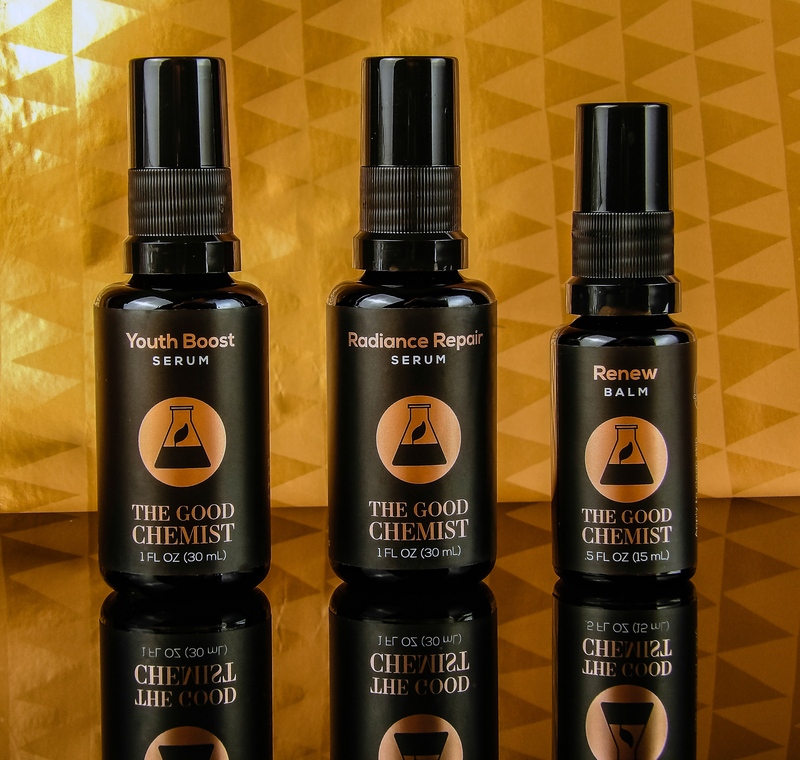 The harsh cleansers we used as oily-face teenagers are too drying for adult skin. Dry skin exaggerates the appearance of wrinkles. Adult acne treatment pairs topical spot treatments, creams and serums with the correct gentle exfoliating cleanser. Exfoliation removes the dead skin cells that trap bacteria and sebum, the fuel of most blemishes. Regular exfoliation optimizes the skin surface for topicals such as Salicylic Acid, Retinol, and Vitamin C serum to remedy adult acne. For adult acne suffers, using SKINovative Exfoliating SKINScrub Cleanser twice a week gently removes flaking dry skin off blemishes in treatment (making treatment more effective and concealing easier) and reduces these pimple-causing dead skin cell “harbors” for bacteria, oil, and sebum. Your skin may be naturally sensitive or made sensitive by Retinol product usage, or due to environmental issues such as harsh winter weather combined with dry indoor forced heating. All three factors make skin extra dry and flaky, making the use of a gentle exfoliant all the more important. Some skin care lines designed for sensitive skin have exfoliating scrub cleansers, but I find any of them don’t exfoliate well enough or they leave behind a filmy residue feeling, almost waxy on my skin. SKINovative cleanser washes clean with no residual to irritate sensitive skin. 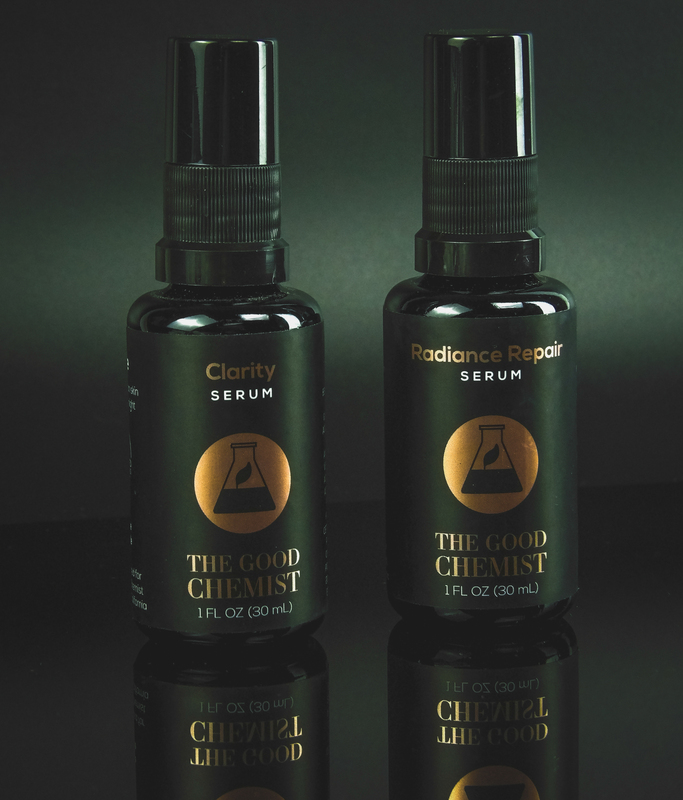 I use Retinol and Vitamin C serum daily, with spot application of Salicylic Acid on blemishes. Retinol can leave skin flaky and requires some exfoliation to remove sloughed dead skin cells. But I tend to avoid scrubs because they feel too rough on my sensitive skin. I found SKINovative SKINFace Scrub Cleanser to be pleasant to use with impressive results. The grains are a fine grain, larger than sugar, but smaller than table salt. You can see and feel them when using the scrub but there are no rough or sharp edges. 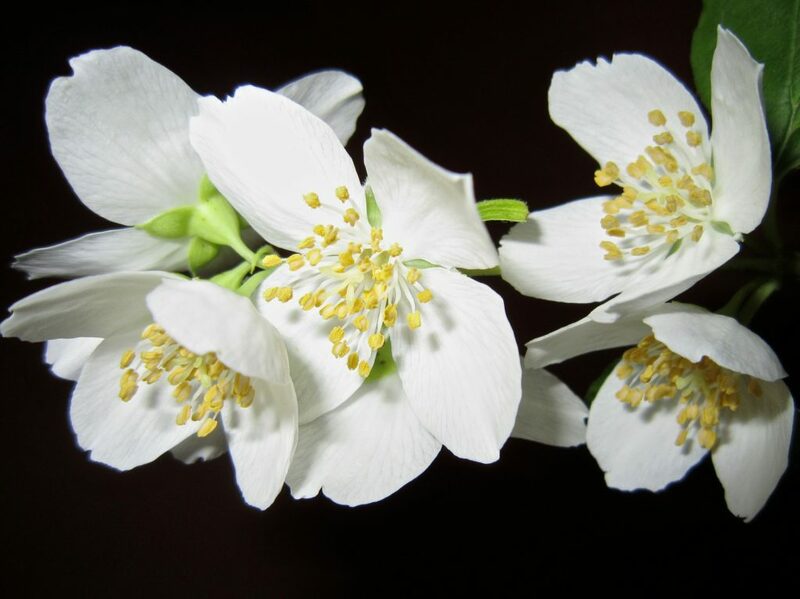 The scent is pleasant, I primarily detect the Orange Peel Oil, as well as Jasmine Oil and Vanilla. Orange Peel Oil adds a lovely scent and has great skin properties! It’s a light froth of creamy emulsion upon use. The grains don’t hurt or scrape, and they don’t melt or break apart. Massage in a gentle, circular motion. It removed mineral-based makeup and foundation as well as a tough to remove lipstain that I typically remove with an oil. 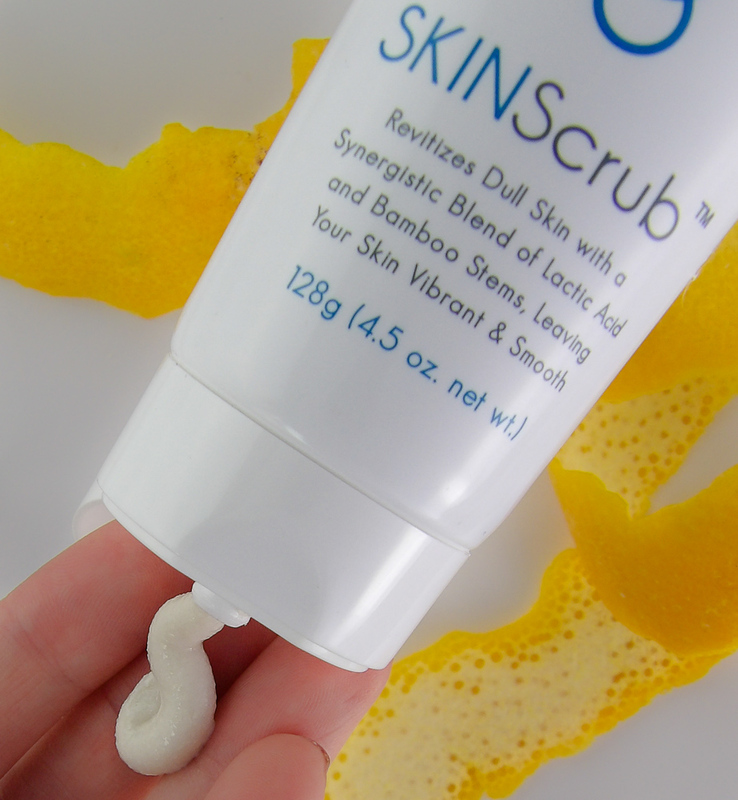 I love how soft my skin feels after use, and there’s no redness, tightness or irritation like I get from most scrubs. There was no film-like residue, it washes away clean. It didn’t sting or burn. After use, my skin looks younger and softer. My skin glows! I especially like the immediate improvement of my eleven lines that I saw even before rinsing off the product. I have a bad habit of furrowing my brow while working. After use, the eleven looked less deep and pronounced. My chapped lips and surrounding areas smoothed out well, making it worthwhile for a pre-lipstick application go-to product. Light reflects off of even surfaces free of dead skin, so “highlight” areas such as the upper cheekbone look younger and smoother. Watching stubborn nose blackheads loosen and begin to purge just while lightly massaging the scrub over them was particularly gratifying. LOTS of dead skin came off, I was surprised how much. Exfoliate 2-3 times a week for best results, and always do so gently, the product does the work, no elbow grease needed. 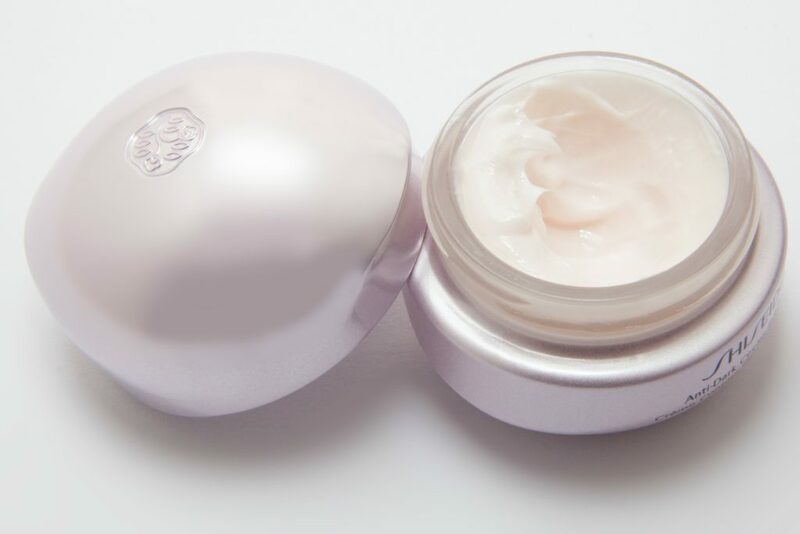 TIP: After exfoliating is the best time to apply your luxe moisturizers to ensure they perform their best and to hydrate your newly exposed skin. After a few days use, the stubborn blackheads along my nose were quickly eliminated. Makeup applies more evenly on exfoliated, flake-free skin and topical serums seem to work even better than before now that they can penetrate into my skin as they should. I wish I had this product when I started using Retinol + Vitamin C years ago! 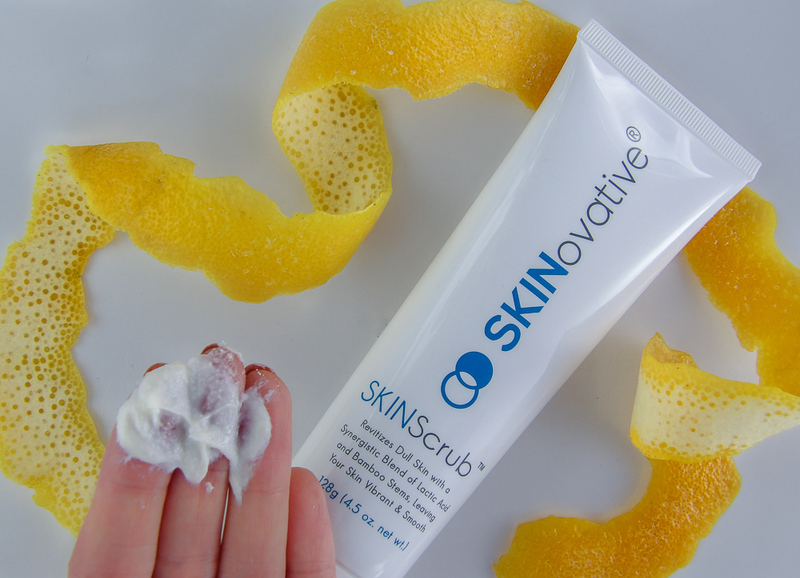 After having such nice results on my face and throat, I tried SKINovative SKINScrub Cleanser elsewhere, including on my chronically peeling, cracked cuticles, on my hands, elbows, and knees. I like that it’s gentle enough for use on the face, nose, throat, and decolletage, while still getting the job done on rough areas, even on my feet. TIP: It says to use a small amount, and that’s true. I found I only needed about half as much as I thought I did for my throat and face. 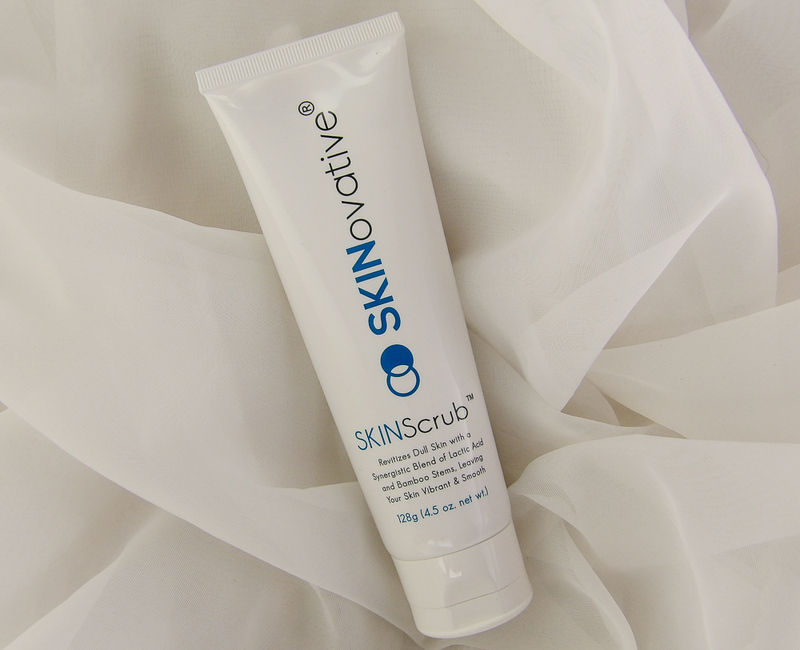 SKINovative Exfoliating SKINScrub Cleanser contains, amongst several natural ingredients notable for skin soothing and moisturizing, both Bamboo Stems and Squalene. These are both highly useful for sensitive skins. 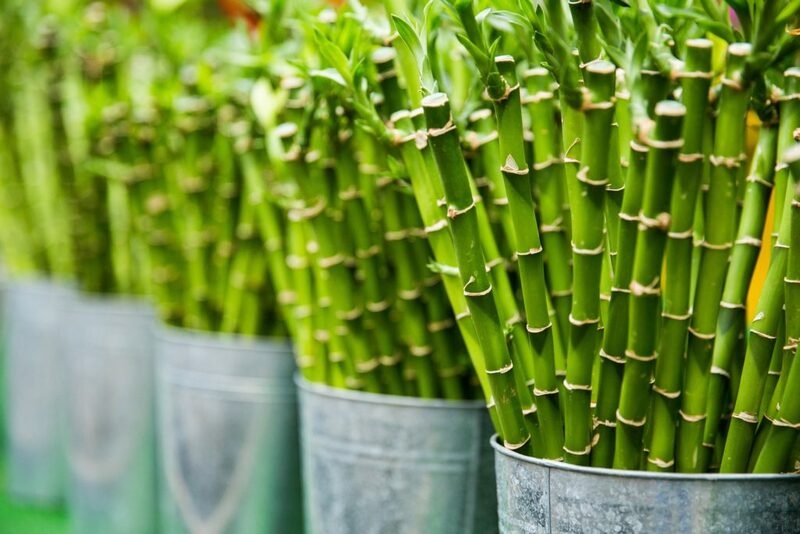 Bamboo Stem Extract is soothing to damaged, itchy or irritated skins. Bamboo also contains nourishing and skin-supportive calcium, magnesium, potassium, vitamins A, B, and C. Bamboo stems also treat uneven skin tone without irritation. Squalene is a unique oil that occurs naturally in the human body and some animals, and it’s high in Vitamins A and D. It supports natural lubrication of skin, oxygen delivery, and toxin removal. Squalene is typically found in mid-level to high-end expensive creams and moisturizers, it’s notable to find a scrub using a treating ingredient like Squalene. 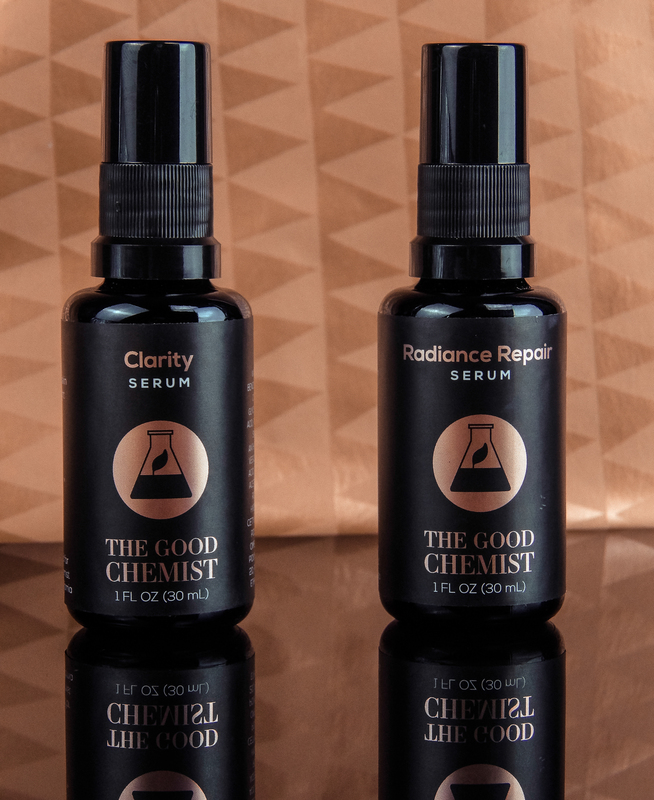 Other skin-nourishing and hydrating ingredients include Lavender Oil (soothing) and Sandalwood (makes skin glow and fades scars) as well as Orange Peel Oil, an excellent anti-aging ingredient which contains Vitamin C to fade age spots, build collagen and reduce wrinkles. Orange Peel Oil is also antiseptic and anti-inflammatory. 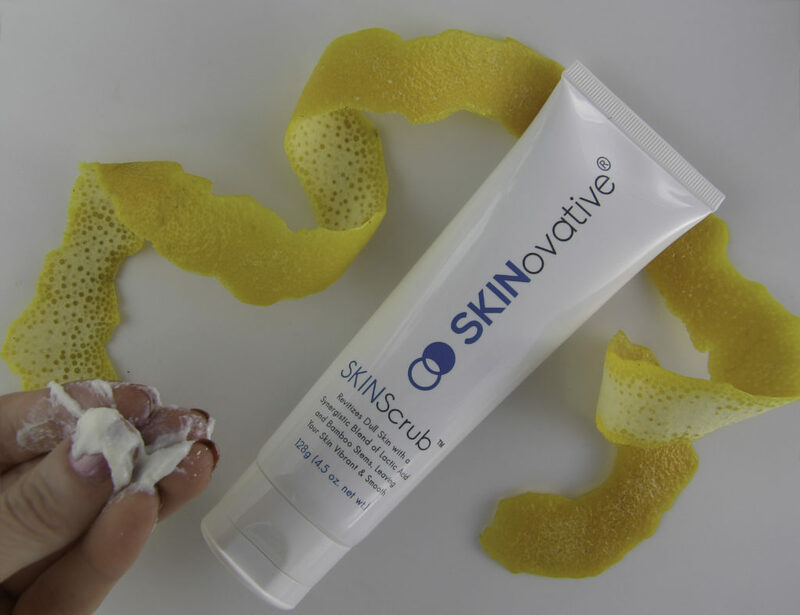 SKINovative contains natural ingredients including Orange Peel Oil, which promotes collagen, reduces wrinkles and is a natural anti-inflammatory and antiseptic. Exfoliation is vital for reducing acne and optimizing the efficacy of skin treatment serums and pricey moisturizers. But for those with sensitive skins, exfoliating scrubs seem a risky proposition. SKINovative Exfoliating SKINScrub Cleanser is not only tolerable for sensitive skin, but it makes an excellent addition to a cell turnover skin care routine such as a Retinol and Vitamin C serum programs, as SKINovative Exfoliating SKINScrub Cleanser provides gentle yet effective exfoliation even for aging, sensitive, acne prone, or sun damaged skin by removing dead skin cells. It uses top-notch ingredients including highly nourishing Bamboo Stem Extract, Lactic Acid, Squalene and Orange Peel Oil. It improves the appearance of wrinkles and maximizes the efficacy of any skin care program. No other exfoliating scrub has left my skin with such a lovely glow! 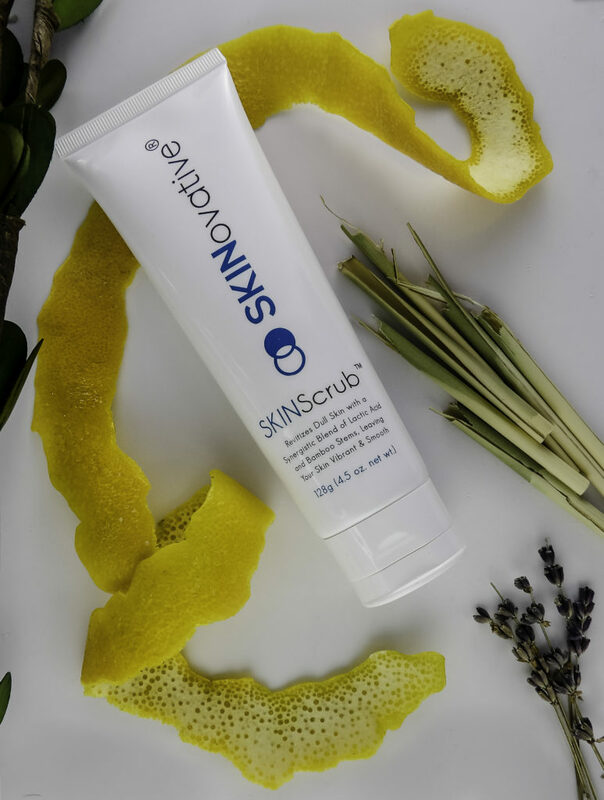 Style Chicks received SKINovative Exfoliating SKINScrub Cleanser in exchange for our unbiased review and received compensation for our time and effort. However, our experience with the product and the opinions expressed in this review are 100% ours.